Magnolia Square in Malvern is in its sixth year and we love that we get to participate in such a unique event. The Melbourne Magnolia Square is to be held this Thursday 26th , Friday 27th and Saturday 28th November. Just in time for Christmas shopping this fair is the perfect place to find the perfect christmas gift. We've had a few days to rest up after the Sydney Magnolia Square and we're looking forward to catching up with our Melbourne friends. 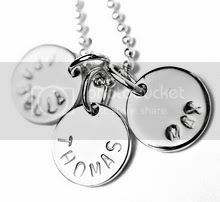 We'll be stamping most pendants, cufflinks, bracelets and necklaces at the fair, pop down and have a look. We love 'giveaway's and this Magnolia Square we're giving away another of our KISS KISS pendants valued at $170, all you need to do is come down and see us and pop your details in the draw....easy! 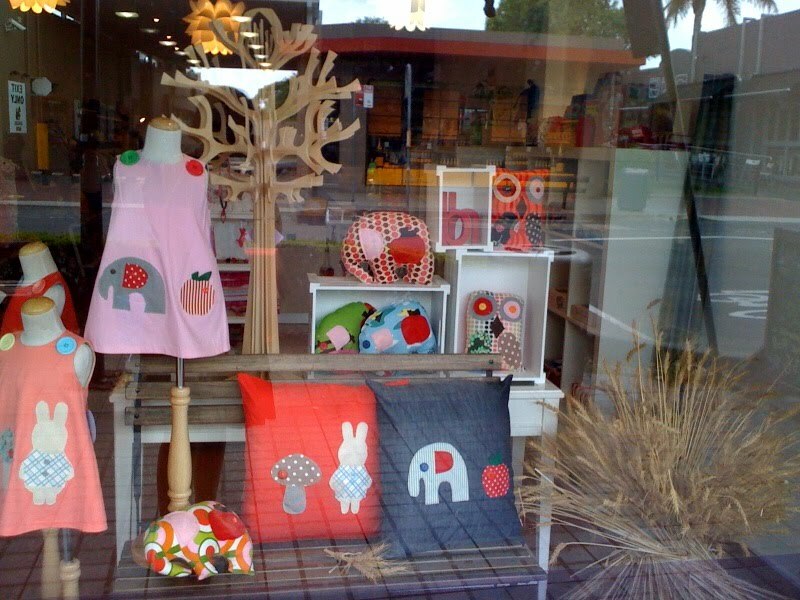 At the successful Sydney Magnolia Square last weekend we caught up with friends from the Infancy stores. Leah and Kate had their gorgeous clothing for little ones on display. I mentioned in my last blog about the cute outfit that Bella Boo was wearing and couldn't resist buying another frock. As part of the visual merchandise display for our stand at Magnolia Square we brought some wheat. The well travelled wheat (it's a 1000kms from Koolaman Station to Sydney) was a great talking point. Instead of returning with it we gave it to a good home for Leah and Kate to use in one of their stores. This is a view of the Rozelle store window. See you in Sydney for the girls' weekend! We're off to Sydney for the gorgeous Magnolia Square which starts on Thursday. In a first for the girls from koolaman designs we're leaving all the babies at home, Bella Boo is now 16 months old and little Teddy is 9 months and instead of our usual trip of coordinating friends to come with us and babysit, it's going to be a girls' weekend. Here is a photo of Bella Boo in a little dress I found at the July Magnolia square from the girls at INFANCY. We're looking forward to exhibiting the koolaman designs collection and also viewing the other beautiful wares at the boutique fair. 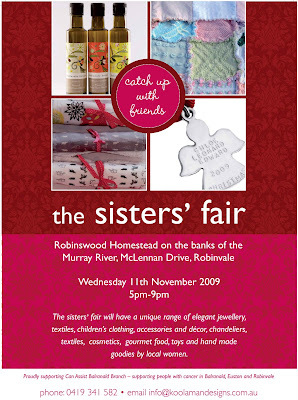 The sisters' fair is an opportunity to catch up with friends and enjoy the visually inspiring pieces. To be held Wednesday 11th November from 5pm-9pm at the Robinswood homestead, on the banks of the Murray River in Robinvale. Proudly supporting Balranald Can Assist branch - supporting people with cancer in Balranald, Euston and Robinvale.